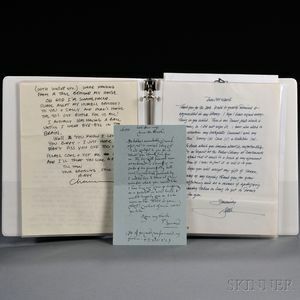 Three-ring notebook containing autograph and typed letters from a variety of modern artists and book illustrators, postcards, and other printed ephemera, mostly from the 1990s; the letters mostly addressed to Edward Worth of Worcester, Massachusetts; including five letters by Pam Rueter (1906-1998); an amusing ALS from Chance Browne (b. 1948); an ALS from Barry Moser (b. 1940); two ANS with holograph envelopes from Leonard Baskin (1922-2000); and others.